Make the Scones: Preheat the oven to 425 degrees F. Line a baking sheet with parchment paper; set aside. In a large bowl, whisk together the flour, sugar, baking powder, salt, cinnamon, nutmeg, cloves and ginger. Using a pastry blender (or fork), cut the butter into the dry ingredients until the mixture is crumbly and there are no pieces of butter larger than the size of a pea; set aside. In a medium bowl, whisk together the pumpkin, half-and-half and egg. Fold the wet ingredients into the dry ingredients until mostly combined (the mixture will seem dry), and turn the dough out onto a clean work surface. Knead the dough a few times to ensure it is completely combined. Pat the dough into a 7-inch circle. Cut the round of dough into 8 equal triangles. Place the scones on the prepared baking sheet. Bake for 14 to 16 minutes, or until lightly browned on top. Cool completely before glazing. Make the Powdered Sugar Glaze: In a small bowl, whisk together the powdered sugar and milk until smooth. Use a pastry brush to spread the glaze over the top of each scone. Allow to set (about 15 minutes) before proceeding with the spiced glaze. For the Spiced Glaze: In a small bowl, whisk together the powdered sugar, milk, cinnamon, nutmeg, ginger and cloves. 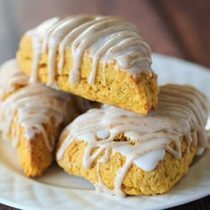 Using a spoon, drizzle the glaze over each scone and allow to set before serving. (If the mixture is too stiff to drizzle, whisk in a splash of milk at a time to thin it out just enough to drizzle.) Leftover scones can be stored in an airtight container at room temperature for up to 3 days.